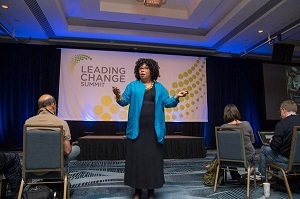 On September 3-6, over 250 nonprofit changemakers connected in San Francisco for the 2014 Leading Change Summit (14LCS). The Summit was organized in three tracks: Impact Leadership, Digital Strategy, and Future of Technology. For integrated marketers, the Digital Strategy track was an opportunity to engage in deep discussions, activate ideas, and explore ways to create change in the sector. All three tracks worked towards the finale event: the Idea Accelerator, where participants switched gears to move from ideas to action plans. The Summit was guided by the question: How will you move forward in your organization? Whether it’s an idea, project, or need that has to be met -- how can professionals in the nonprofit sector utilize the technology available to more effectively meet their mission? The conference began with the opening plenary, “Moving from Diversity to Inclusion: Changing landscapes of nonprofit technology,” led by keynote speaker, Deena Pierott (photo right), Founder of iUrbanTeen and President and CEO of Mosaic Blueprint, and facilitator, Lisa Heft from Opening Space. In a mission driven sector, the audience, which was mostly nonprofit, reflected deeply on this statement. The message from this keynote resonated with participants and carried on throughout the rest of the Summit, where some participants, including Nam-Ho Park, Managing Director, West Coast and Director of Mobile Services for Forum One Communications, started a discussion at the unconference session on Friday, September 5 about “who technology does not serve,” with Deena. Another topic discussed was how integrated marketers can demonstrate impact in an effort to persuade their community to take action -- such as to donate, sign up, attend -- and how to widen the scope to broader audiences. This requires the support and alignment of all staff in an organization. Although participants differed in mission, attendees found parallels in discussing processes and strategies. For example, on Day 1, participants worked in groups to develop a digital strategy based on a hypothetical scenario: Convince a local councilwoman to vote “no” on imposing mandatory rations on water. Participants also discussed two digital campaign case studies: #Ferguson and #ALSIceBucketChallenge, and examined how both campaigns unfolded online, the moments that were capitalized on, and the effects they've had on the country. During the three days of deep discussion and brainstorming ideas, participants were challenged to think big about where the gaps might be in their technology, and if given the coveted hypothetical resources, what tool or program could be invented to help them more effectively meet their missions? At the end of Day 3, participants from all tracks could pitch their preliminary ideas during the Microsoft evening reception. 24 individuals pitched ideas, from projects such as “Conference Match,” an app to facilitate networking for conference goers through matchmaking, to timely resources such as “Campus Light,” a website that facilitates peer-to-peer communication and resources for specific colleges to support students experiencing harassment, depression, and psychological disorders. The 24 ideas pitched were inspiring, concrete solutions of how the nonprofit sector can create social change. “I wanted to connect technology to my interest in nonviolent communication and to educate people about how our words can cause unintended harm,” said Yee Won. “Words matter, and it’s surprising how certain acceptable, everyday words convey violence. This platform we pitched addressed topics such as violence, racism, classism, sexism, and ableism." All Idea Accelerator participants are encouraged to continue refining their pitches, work on their projects, and document their progress going forward on NTEN’s blog. The full list of winners and pitches can be found on the 14LCS website. Marketers are often responsive to the situations in front of them, for example -- what digital strategy should be put in place in response to a current event taking place, such as Ferguson? However, marketers must be savvy about also developing proactive, integrated solutions to meeting their broader organization strategy, and question: What unintentional exclusion might be happening with the very tools that we use to engage our audiences? Nonprofit organizations are a public trust, and it is the responsibility of the sector overall to be responsive, but with eyes wide open to the bigger picture ahead.